(Nanowerk Spotlight) Surface energy is ubiquitous in nature and it plays an important role in many scientific areas such as for instance surface physics, biophysics, surface chemistry, or catalysis. So far it has been impractical to consider utilizing surface energy as an energy source because there are few molecules or atoms involved in the surface interaction and the density of surface energy is low. However, due to the lower power consumption requirements of nanotechnology devices and the higher specific surface area for nanomaterials it appears attractive to use surface energy at the nanoscale. 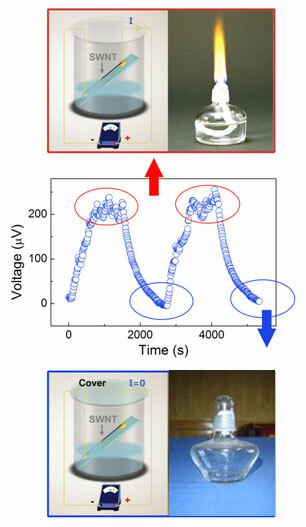 Researchers in China have now demonstrated that an effective design of single-walled carbon nanotubes (SWCNTs) can be used to convert the surface energy of liquids into electricity. "Our research demonstrates that SWCNTs can be used to harvest surface energy and convert it into electricity" Lianfeng Sun, a professor at the National Center for Nanoscience and Technology of China, tells Nanowerk. "Our surface-energy generator can be used to design self-powered devices at the nanoscale. Its advantages are: high power output (up to about 1800 pW per device); low inner resistance (tens to hundreds of Ohm); stability (the polar liquid can be used like fuel); and no moving parts. It is easy to integrate with other low-energy-cost electronic devices and power them. Furthermore, the generators can be connected in serial and parallel to enhance their performance." In a recent paper published in Advanced Materials ("Surface-Energy Generator of Single-Walled Carbon Nanotubes and Usage in a Self-Powered System"), Sun and his team ascribe the surface-energy generator's mechanism to the unique channels among individual SWCNTs, in which a continuous, steady flux of liquid forms. Because the flow of liquid inside the carbon nanotube channels is driven by surface tension, these generators were named surface-energy generators. The researchers fabricated a SWCNT 'rope' of approximately 25 mm length and 0.6 mm diameter by aligning individual nanotubes. They connected this rope to electrodes of aluminum film and suspended this structure on a glass slide. This device is then placed into a beaker partially filled with ethanol, with an angle between the SWNT rope and the ethanol level. Dynamic characteristics of the open-circuit voltage are then monitored when ethanol is added into the beaker. "In an open beaker, no obvious open-circuit voltage is observed at the beginning at an angle of 40°" explains Sun. "When the ethanol level reaches the SWCNT rope, the voltage begins to increase. This increase is almost linear from zero to 200 µV for the first 240 seconds, then the voltage saturates gradually at 219 µV where is remains constant over 6 hours. We found that the voltage can remain constant as long as the ethanol level is contacting the SWCNT rope." Sun notes that the inducing rate of the open-circuit voltage, its magnitude, and the optimum output power can be significantly enhanced by the Marangoni effect. The result is a self-powered system that shows the advantages of a smaller inner resistance, a lack of moving parts, and no application of an obvious external force. "Nano-devices need clean, portable and high conversion efficiency energy source" says Sun. "Our research opens the possibility to design various self-powering nanodevice system without external energy. By improving the performance and output energy of these generators, it may even be possible to power traditional electronic devices such as chemical sensors."